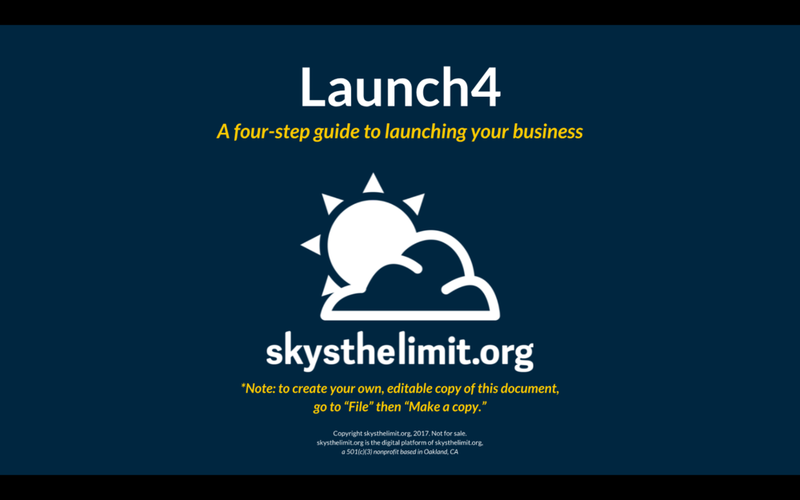 Our Launch4 Guide will help you take you from IDEA to LAUNCH in four steps. If you complete one module per week, you could be selling your product or service in just one month. However, this can be done at your own pace and may take more or less time depending on how many hours you are able to work on your business each week. You'll need to complete this (to the best of your ability) and send to me for review before you can request support from a volunteer. Please scroll for instructions on how to access and complete this guide. 3) Use your name in the title when you save your copy. Once you’ve saved your own copy, you can fill out your guide by typing directly in the document. 4) When it’s complete, just hit “Share” and send your completed guide to program@skysthelimit.org, so we can review it! In order to help support you through the Launch4 Guide, you are also invited to join our private Facebook Group, where entrepreneurs like you can ask questions and receive advice and support from myself as well as some of our volunteer mentors and advisors. For instructions on how join our Facebook Group, please us the link below.